← Water Line and Sprinkler Head Replacements – Leaks! Effluent water is recycled sewer water. It is not potable (not for drinking, not for bathing, not for cooking) water. It is not used IN hospitals. 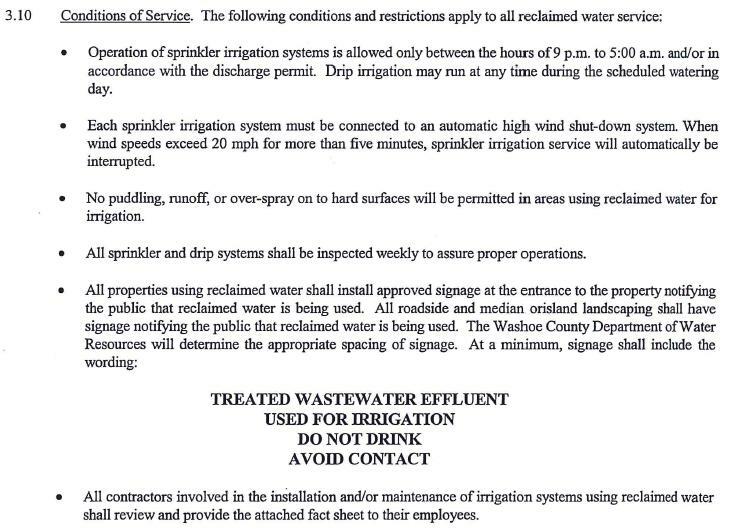 Here is the Washoe County’s Requirements and Schedule of Rates and Charges for provision of Reclaimed Water Service Ordinance No. 1299. Duly note Articles 3.1; 3.5; 3.10 and 3.20 reproduced here for your reading pleasure. So, squishing around in flooded greens or watching the excess flow into the storm drains is not the proper use of effluent water. Here in “Northern Nevada Water Planning Commission Agenda Item 8 Effluent Management Strategy” are the percentages of reclaimed water usage in Washoe County. The pertinent paragraph is highlighted in yellow starting at the bottom of the document’s page 3 and finishing at the top of page 4. This entry was posted in ArrowCreek411, Effluent Water, Fertilizers, Herbicides, Pesticides, Poisoned Golf, Polluted Golf Courses and tagged ArrowCreek 411, ArrowCreek411, Effluent Water, Environment Impacts of Golf Course, Environmental Impacts of Golf Course, Fertilizers, Herbicides, Northern Nevada Water Planning Commission, Pesticides, Poisoned Golf, Polluted Golf Courses, Washoe County. Bookmark the permalink.